With her career, live-in boyfriend and loving family, Piper Kerman barely resembles the rebllious young woman who got mixed up with drug runners and delivered a suitcase of drug money to Europe over a decade ago. But when she least expexts it, her reckless past catches up with her; convicted and sentenced to fifteen months at an infamous women’s prison in Connecticut, Piper becomes inmate #1187-424. From her first strip search to her final release, she learns to navigate this trange world with its arbitrary rules and codes, its unpredictable, even dangerous relationships. She meets women from all walks of life, who surprise her with tokens of generosity, hard truths and simple acts of acceptance. Now a major original televison series, Piper’s story is a fascinating, heartbreaking and often hilarious insight into life on the inside. The United States has the highest number of people in prison in the whole world. The author of the book was incarcerated for 15 months in a US prison after pleading guilty to drug0-related crime. One reader was really surprised at how much she enjoyed the book. The insights into the US prison system were very interesting. The book reviews were not good, but the book group found it a good read. The writing is not in a classic style but it was easy to read and the group is glad to have read it. 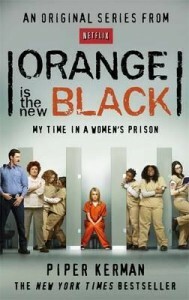 This entry was posted in Book Reviews, Books to Screen, Non Fiction, Recommended Reading and tagged book review, Orange is the new black, Parramatta Library by admin. Bookmark the permalink.